We do love some of the labours of love on the part of amateur historians and genealogists that achieve a level of true expertise, as with our case in point today. Occasionally, someone writes a comment on a FGB post of such interest and erudition that we ask them to tell us more. A couple of weeks ago, we had such a comment from a gentleman, pointing us to his remarkable work. Thus, we present the website of Jean-Christophe Shigetomi, dedicated to the Tahitian soldiers of World War I, Les Poilus tahitiens. By 1916, we learned, when the First World War had been going for two years, so many Frenchmen had died that army recruitment extended to the colonies of Tahiti, New Hebrides and New Caledonia. These recruits and others formed the racially segregated Bataillon mixte du Pacifique. While a fair number of websites can be found about the battalion, only that of Monsieur Shigetomi is exclusively about the Tahitians. Monsieur Shigetomi retired after a career in civil aviation and has since indulged his passion for the history of Tahitians in the wars of the twentieth century. For the poilus, what he has done is to take the military service records of each man and put their photographs and details on the website. Using the information from the files, he has also written histories of the Tahitian action, primarily the Battle of Vesles-et-Caumont, and individual's activities during the war, giving a very personalized account of events. Much of this is presented on the website and a kindle edition of his entire book may be found here. For genealogical researchers, use the drop-down menu on the site entitled Unités, meaning "units". Under each unit is the category fiches signalétiques, meaning identification cards or data cards, which leads to a list of names. Click on a name to see the man's full name, photograph, details of birth and death, along with notes as to his service. Once you are certain of the spelling of the name, you can find all mentions of the man via the Recherche, or search, option. As Monsieur Shigetomi points out, this website may be the only way that researchers will have access to this data and, especially, to a photograph of the soldier. This may be an excellent resource for those researching Tahitian ancestry or World War One. 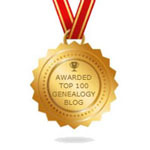 There are so many unsung, rarely noticed and even more rarely praised yet stellar contributors to genealogical research. Sandrine Jumas is one of them. Many have uploaded onto the Internet and indexed extracts of the documents that they have found in their research but few have done so in such a clear fashion as Mme. Jumas has done on her site Relevés Ardéchois. It is small but a treasure and something that one finds increasingly. Some French family historians who have been working for years on their family genealogies then take all of the original documentation that they have found (in this case parish and civil registrations, along with some notarial records) and present that in a way that is helpful to others. We find this to be astonishingly generous and believe that all like Mme. Jumas deserve thanks. She also presents two massive lists of notarial records she has indexed. The first is of marriage contracts and the second of other notarial records. Both give a significant amount of information, allowing a researcher to know exactly which document to request to be copied by the archives. If you are lucky enough to be researching ancestors from one of the towns listed above, do have a look at this website. If your research takes you elsewhere, look hard for you may find something similar by an equally generous soul who has been working on your area of interest. Look also on the arbres généalogiques on Geneanet.org where, increasingly, volunteers are entering data, taken from parish and civil registrations, for entire towns, showing the family relationships and giving the source documents. Add this type of website and "town tree" to your arsenal for research. The Ministry of Culture and the hundreds of dedicated French genealogy enthusiasts here have created something quite remarkable in the Grand Mémorial website. It is the central research point for the military documentation on all who served France during World War I. It is not yet finished but is very impressive already. It is a central search facility with links to each department's military recruitment lists for men of an age to have participated. It also links to the recruitment lists from colonies, held on the Archives nationales d'Outre-mer website and to the death registrations made by the army on the Mémoire des Hommes website of the Service Historique de la Défense (SHD). Click on a name and you are taken directly to the image. The French penchant for statistics is in evidence in the column to the side, which gives a summary of the details concerning the names in your search result. This is handy for genealogical statisticians, we suppose, and is rather cool. It shows how many of the results give the place or the date of recruitment, how many the place or date of birth. We like knowing how many were of a particular profession (four of those named Mordel were farmers, one was a baker, etc.) and how many could read or write or count (we must all say a prayer of thanks for universal education at this point). A map shows which departments are covered and the status of their military recruitment registers being indexed and online. As can be seen, about half of the country's recruitment registers are included on the Grand Mémorial website, which we find to be really quite impressive. The map does not include anything on people from the departments of Alsace and Lorraine (Haut-Rhin, Bas-Rhin and Moselle) because they were not, at that time, a part of France. More, what the site does not say, is that the people of those departments were, from 1871 to 1918, German citizens. Any men conscripted served in the German Army. The records concerning those men were held in Berlin and were all destroyed in the bombing of Berlin during World War II. Thus, it is not possible to find a military record for a man from that region during that time. There will be no military recruitment registers for departments that did not yet exist: Essonne, Hauts-de-Seine, Seine-Saint-Denis, Val-de-Marne and Yvelines. The recruitment registers for the departments that existed then but that do not now exist, Seine and Seine-et-Oise, are to be found in the Departmental Archives of Yvelines. As concerns registers held by the Archives nationales d'Outre-mer, those of Algeria and French Polynesia are almost all online. It is pointed out that thes registers concern only those persons who held French nationality at the time of recruitment. The registers for non-nationals are held at the SHD. For recruitment registers from Morocco, they cover only French nationals born in France or Algeria and living in Morocco when they turned twenty years old; the registers cover only the years 1913 to 1921. The recruitment registers of Moroccans are also held at the SHD at Pau. For those researching an ancestor who fought for France in that conflict, this website would most definitely be the place to begin. And now, permit us, please, to present a trailer of "The Burying Party", a film about Wilfred Owen, the British poet who died fighting in France, and in which Sid plays Siegfried Sassoon to perfection. The Burying Party Official Trailer from Sine Wave Media on Vimeo. Oh, Dear Readers, we have been experiencing a series of unsuccessful moments of late. Recently, we were told that our suggestions and aids to you in your French genealogical research are "too professional for the ordinary family genealogist". Dear Readers, we take that as an insult to you and to anyone who is striving to provide the best possible history of his or her family. We are as aware as anyone of how the initial thrill at the volume and ease of genealogical discoveries on the Internet can make us balk at anything that requires more work, and call it a "brick wall". Yet, if we build our family history on only the easy discoveries, we risk producing something so scant as to be minimalist. We are reminded, by way of comparison, of our hoydenish mother, who studied piano all her life. She was enamoured of the difficult études and mazurkas of Chopin but was not really willing to do the work to master them. Instead, she used her considerable charm to convince her teacher to rewrite the pieces, leaving out all of the "hard notes". She then blissfully played these denuded ditties, indifferent to the fact that they sounded more like nursery rhymes than Chopin. Surely, Dear Readers, you do not wish your genealogical research to be the minimum, composed only of what was quick and easy to find? Surely, though some of the skills and procedures we explain in this blog are a struggle, some of you have found the results to have been worth it? At the same time, we do try to help here with clear and concise explanations of how to use various French websites and archives. We make a point of testing every website before we write of it here. It was in an effort to try out a newly announced website that we ran into another unsuccessful moment. There have been a number of genealogy bloggers in France who have passed on the publicity concerning new access to government archives concerning refugees and stateless persons, Office français de protection des réfugiés et apatrides (OFPRA). This was and is an important part of the government for it is this office that decides who receives asylum and who is to be granted refugee status. In its early days, it was particularly involved with refugees from the Russian Revolution who found their way to France. Their archives are open to the public after a certain waiting period. For files concerning individuals, that wait is fifty years after the date of the last document entered into the file. The recent exciting announcement stated that the files concerning people who had been granted Nansen passports can now be seen online. With a modicum of fanfare, OFPRA's website encourages "Internet users, descendants of refugees, genealogists and historians" to apply to use the site and to participate in indexing the documents. We applied. Receiving no response, we applied again. A few days later, we received an old-fashioned, possessive archivist's haughty rejection. Our "interest", we read, was inadequate. Our two applications were perceived as a devious effort to get round the barrier, though we had not suspected its existence, but a barrier does indeed exist. We reread the invitation to the public to apply. Can one find a broader term than "Internet user"? We have the impression that the invitation and publicity were written by someone younger or perhaps by the senior managers of OFPRA and that the archivist, possibly someone much older, did not approve of the move and is doing all that he or she can to obfuscate it. Oh, how many times we have seen this innate desire to thwart! We urge any and all of you, Dear Readers, if you have an ancestor who had a Nansen Passport and was in France, not to take the lazy route but to apply to OFPRA for files concerning that ancestor. It clearly will not be easy but do not give up. When you succeed, please do write and tell us about it.